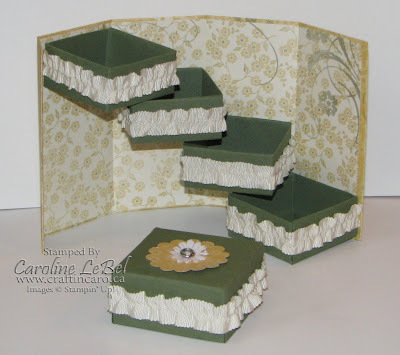 Craftin' Caro: July Club Project - Stepper/Fantasy Box! July Club Project - Stepper/Fantasy Box! Happy Thursday everyone. I'm happy to share with you the project that my monthly Stamper's Club members will be making this month: they are fabulous & fun Fantasy/Steppers Boxes! These super cool boxes with the staggered 4 "drawers" inside are made using our double-sided Designer Papers... just imagine all the amazing permutations you could make with them. 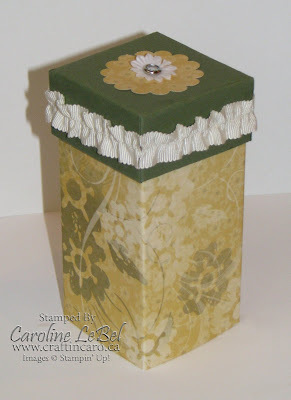 This particular box that I made this afternoon as a sample uses the "Le Jardin" papers, and I expect that it will be retiring this year since River Rock is one of the coordinating colours in the pack. If you're in Toronto/GTA, want to join us? There's still room! Club meetings are free with a minimum $25 purchase; please bring your scissors, adhesives, bone folder and a personal paper trimmer. Club members who order one of the 25% off Hodgepodge Hardware kits can also get the matching Vintage Brads for only $8 each (reg. $10.69) or Jumbo Eyelets for $10 each (reg. $12.04)! You'll also find the full directions for the Stepper/Fantasy boxes on the Stamper's Club Blog.